Alaska is once again the land of the midnight sun. 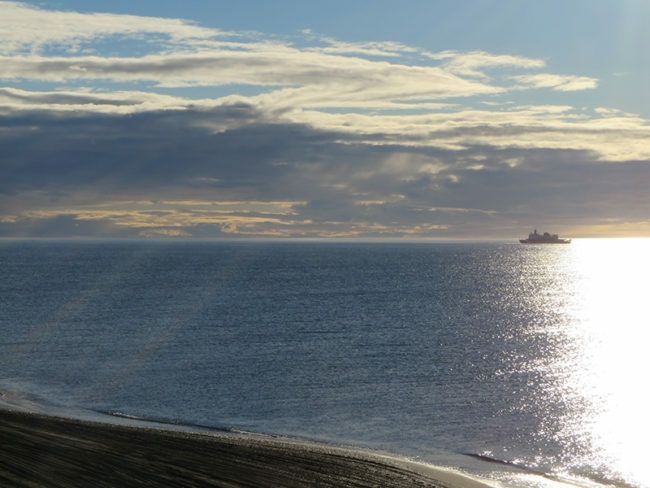 If you live in Utqiaġvik (formerly Barrow), the sun won’t set again until August 2. Brian Brettschneider with our segment, Ask a Climatologist, said the sun rose on May 10 in Utqiaġvik at 2:54 am. Brian: This is notable because it’s not going to set for quite awhile, until 1:56 am on August 2. So it’s literally going to become, as it does every summer, the land of the midnight sun. And this will actually be the first time it’s the land of the midnight sun after the name change, so there’s something notable about that. Annie: Do they have the same amount of 24 hour sun in the summer as darkness in the winter? Brian: That’s an interesting question because there’s this notion that this all balances out. You get all this sunlight in the winter and then you get the darkness in the winter. But it’s actually not the case. So up in Utqiaġvik, they have 84 days with 24-hour sunlight and in the winter it’s 65 days with no sunrise. That’s about a 19 or 20 day difference, so the summer is longer than the winter is by several weeks. And the reason for that is the shape of the earth’s orbit. We’re actually not quite a circle orbiting the sun, we’re like an ellipse and in summer we’re farther away from the sun. So to conserve angular momentum, the earth moves a little slower around the orbit and consequently our summers are longer than our winters. Annie: It seems like we’re cheating or something. Brian: When people say, ‘yeah you get all this daylight in the summer, then darkness and it all evens out,’ that’s not actually the case. If you map out the amount of daylight for the entire globe, it maxes out right at the Arctic circle, so right here through Alaska, we get more hours of daylight than they do anywhere in the lower 48, or anywhere in the southern hemisphere. On May 10, we have more daylight than they’ll see in the lower 48 even on their longest day of the year. We’re really adding daylight fast and still have about another five or six weeks to go to add even more daylight.